Today's blog post is going to be a very girly one, so if you're not interested in reading about hair, then it's probably a good idea to skip this one. I'm going to explain the journey I went through dying my hair. Covering the last 5 years, my hair goes from black, to dark brown, blonde, then red. And didn't start going to a salon until the last 6 months. I'll try to list as many products as I can so hopefully you find this helpful. And the results of the hair dye will be more accurate if you were born with black hair like me. If you're dying your hair for the very first time, it's most likely that the color will barely show. Also, depending on what type of hair dye you use, the results will be different. I've tried different western brands like Revlon and L'oreal, but they really don't work on my dark Asian hair. 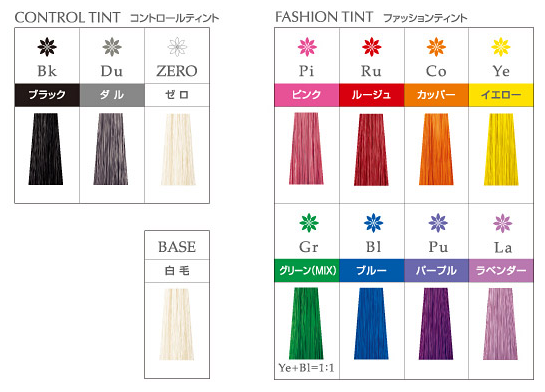 What works best is the Japanese hair dye brand - Palty. It's really simple to dye your own hair with Palty, you just need to mix bottle 1 with bottle 2, shake it and then apply it all over your hair. The results are usually pretty good. And that's how I started lightening the shades of my hair into a light brown hair color. I also recommend the foam or bubble hair dye, it dyes your hair much more evenly, and is easier to work with since it doesn't drip everywhere. 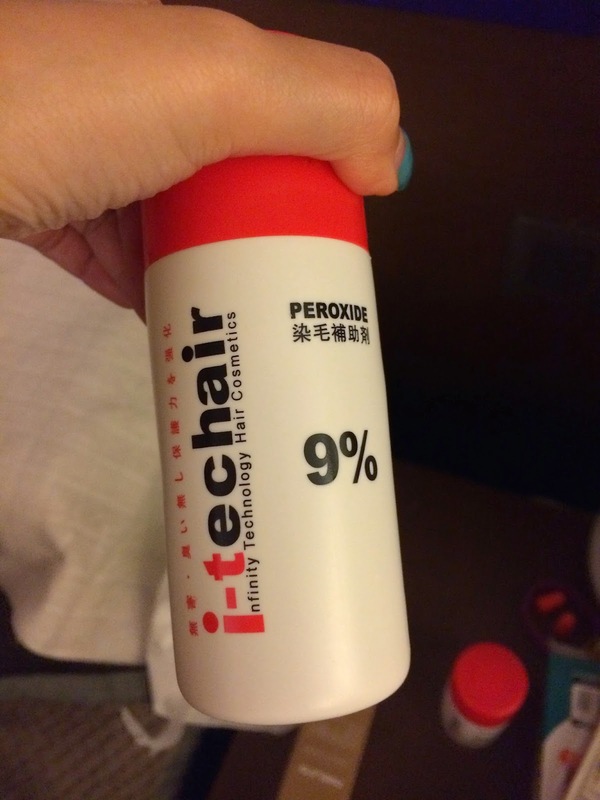 In the US, I usually get Palty hair dye on eBay or just Chinatown supermarkets. 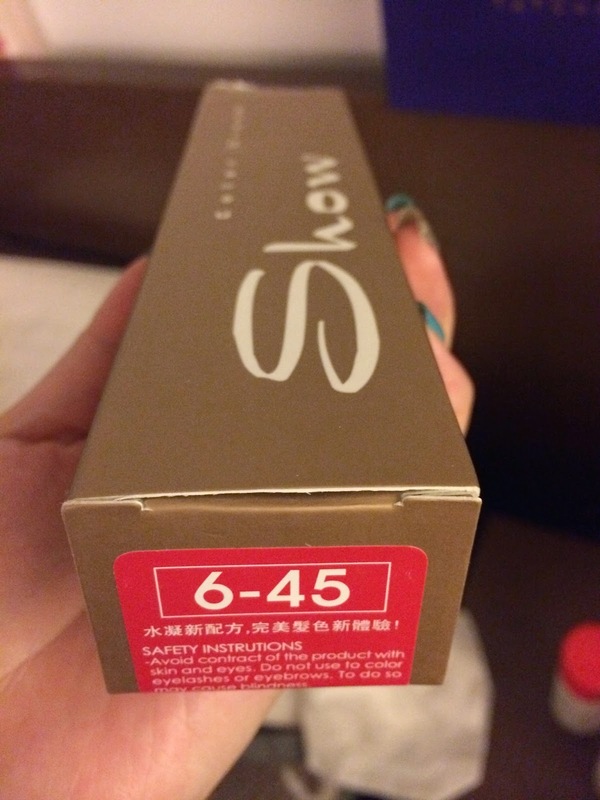 In Hong Kong you can find them at 759 makeup store or SaSa. In order to get blond hair, I had to use bleach dye, and I stuck with Palty. The first time I bleached it I was very careful because I was a bit worried I would ruin my hair. But after bleaching it my hair wasn't damaged at all. I just needed to make sure I condition it every day and it still stayed very slick and straight. I've never straightened my hair with chemicals in my life, and I only occasionally use a hair straightener. 2012: As my hair grew out, I didn't continue bleaching my hair. Instead I just filled it with normal brown dye, and unexpectedly it had a very beautiful ombre effect. 2013 - 2014 Most of my hair is a light brown, a result from dying bleached hair with brown dye. 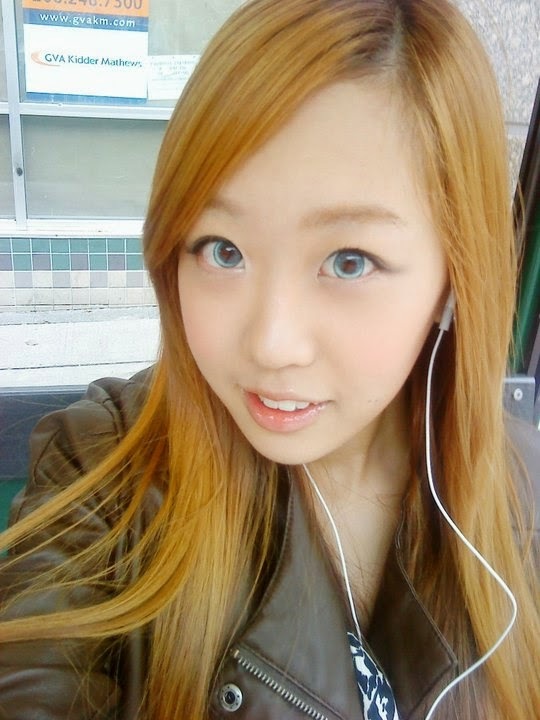 I actually wanted a bright orange color, and I thought I should go to a salon and let the professionals dye my hair. 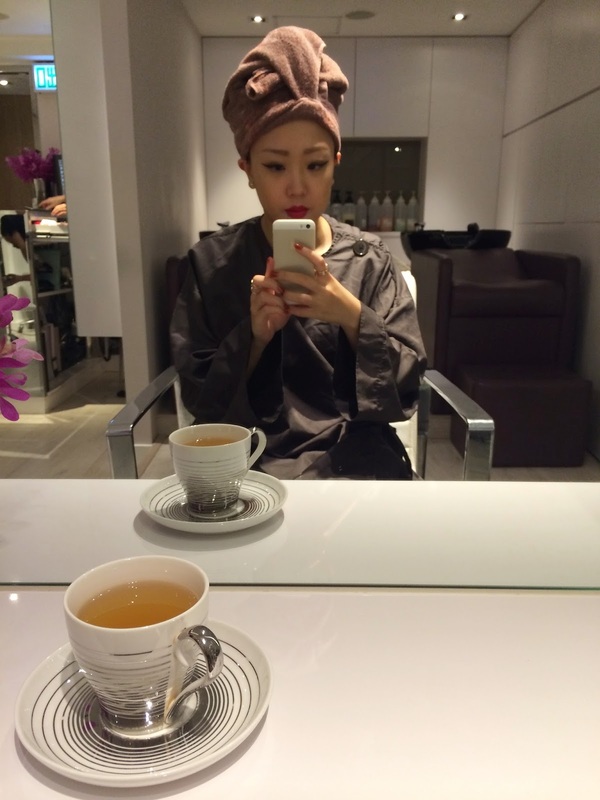 I chose a Japanese salon (Chicca) just because I thought they would know Asian hair best. Originally I walked in prepared to have my hair bleached because I knew I need to lift several shades before the bight color can show. 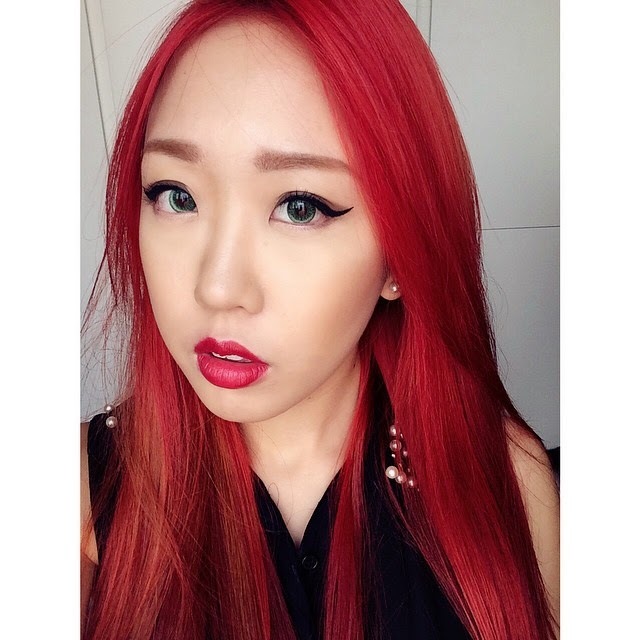 But then the salon suggested me to apply red dye twice to brighten my hair so I don't damage it. Respecting their professional opinion, I went with it. It was much more red than I thought, but they said the red would fade as I wash it, and I trusted that. But actually I still liked the red a lot. What was disappointing though, they didn't say how fast it should wash off, or what I should do to keep the red dye in my hair. And after just 4 washes, my hair became a dark brown. I was absolutely disappointed and very pissed off, because I wasted money on not getting the color I wanted AND only had my hair colored for 4 days. Day 4 after red hair dye - most of it washed off. I went back to Chicca salon after all the red washed off, all evidence ready (my pictures and also a towel covered in red dye that fell off), pretty much prepared to demand a full refund and redo of my hair. This time they bleached my hair for free, and I decided to tell them to stop at the bleach. I went back to dying my hair myself, and trusty old Palty bleach dye. 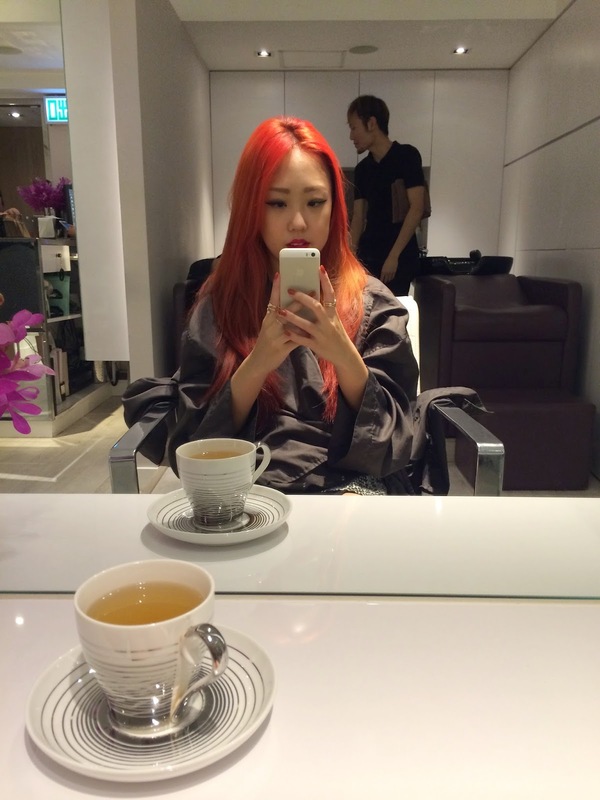 (Salon visit was HK $800 or US $100 vs Palty dye HK$60 or US $7. Duh, of course I'm choosing Palty). Second wave of bleach, which was done by myself after the salon did it. You can see a clear difference, the bleach that the salon did was fading, AGAIN. At least the ombre effect looked nice. I actually really liked my blonde hair, but it was way too high maintenance. I was re-bleaching my hair every month and that was a pain but also felt very damaging. So I decided to give up having blonde hair. Now that I have a good base (blonde) to work with, dying my hair red was much easier. I was also much more prepared since my last disaster experience. This time I had a very bright red hair dye and a strong developer, I also bought some shampoo that helps keep color in for red colored hair. The results were amazing, but I also noticed patches of blonde that only turned orange and the dye wouldn't soak in (will explain more a bit later). It stayed bright red for about a week, and after 4 washes, my hair had a very beautiful red/orange ombre effect. I joked that I look like I bumped into a sunset and all the colors fell on me. About 2 weeks after dying my hair red, I decided to get a hair cut just because it was getting very long. I visited The Strand, only to get hair cut (I didn't get my hair colored there). 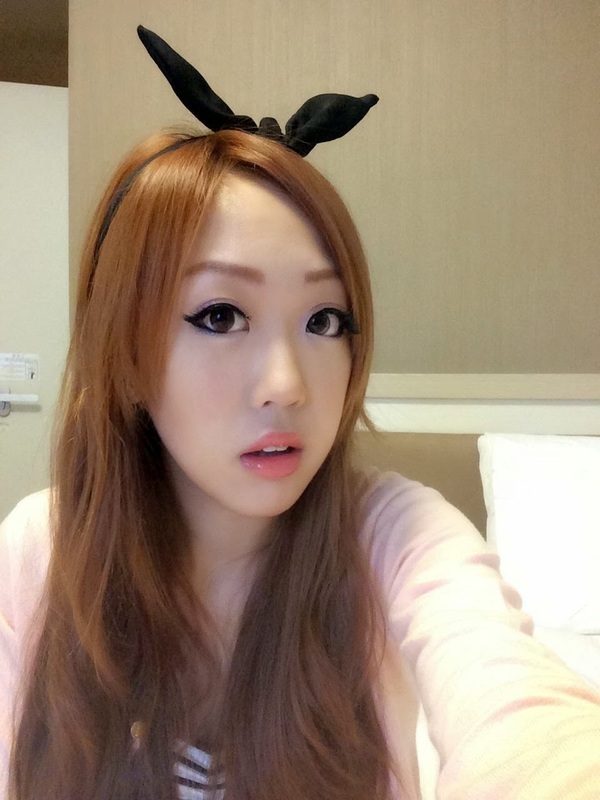 The cut with a senior stylist was pretty pricy, at HK$600 (US $77). But I really only get a hair cut no more than 3 times a year, I like my hair long. The best part though was that the senior stylist gave me a ton of suggestions on maintaining red hair. He did not try to sell me any salon products or try to get me to color my hair at their salon. Instead he gave very honest and professional recommendations. He told me, the reason why some of my bleached hair wasn't soaking the red dye was because that the bleached widened the holes in my hair follicles. Red dye also has bigger and heavier particles so it's harder for red dye to stay in my hair. The solution? He suggested me to buy some semi-permanent dye to refill the red color. Semi-permanent dye doesn't have the damaging developer mixture so it won't damage my hair further. 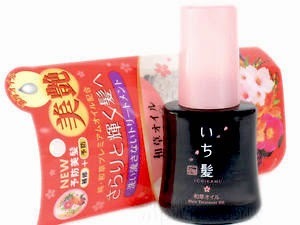 Hence I can use it more often and brighten the color more.The best place to get cheap, wholesale priced beauty supplies is near Temple street (Read more from this article: The Secret Spots Salons Don't Want you to Know About). This method really worked for me, and I'm very grateful that my hair stylist at The Strand was kind enough to explain to me and show me how it should be done. From Temple street's beauty supply shops, I bought color stabilizer shampoo (the big white bottle on the left). Also 2 different types of semi-permanent hair dye. 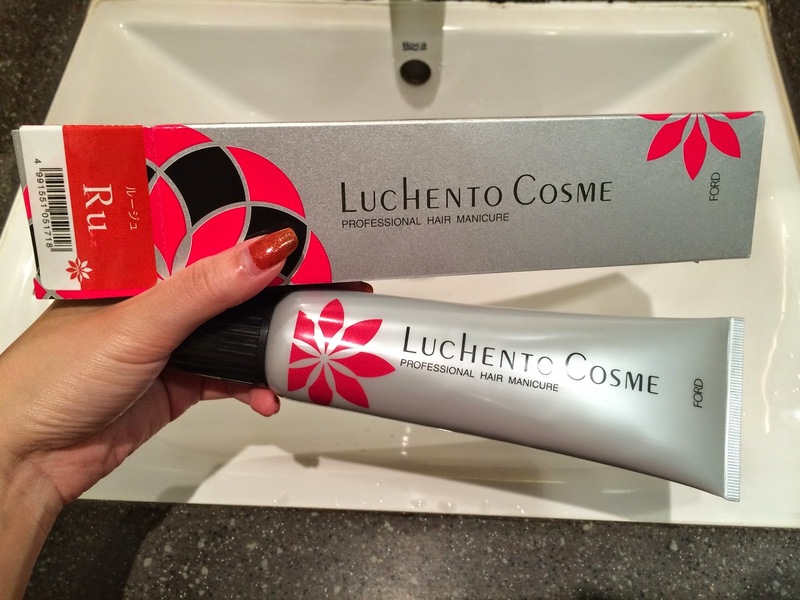 The grey bottles are from a Chinese brand (www.ida.com), and then the grey tube is a Japanese brand (Luchento Cosme). I'd say they are both good in different ways. All 4 items together was only around HK$500, which would last many rounds of color retouching. - Pros: Easier to work with, thicker in texture so it doesn't drip everywhere, the pump makes it easier to use. - Cons: The color isn't as bright as I want it. Looks more like a washed out red as to a bright red. So I guess my hair is going to stay red for a while. I might go for the Luchento Cosme orange color "Co" for a brighter look as we approach summer next year! But we will see. And I will definitely stick with coloring my own hair for the rest of my life. Never am I paying a salon to dye my hair again. How do I keep my hair healthy and silky? 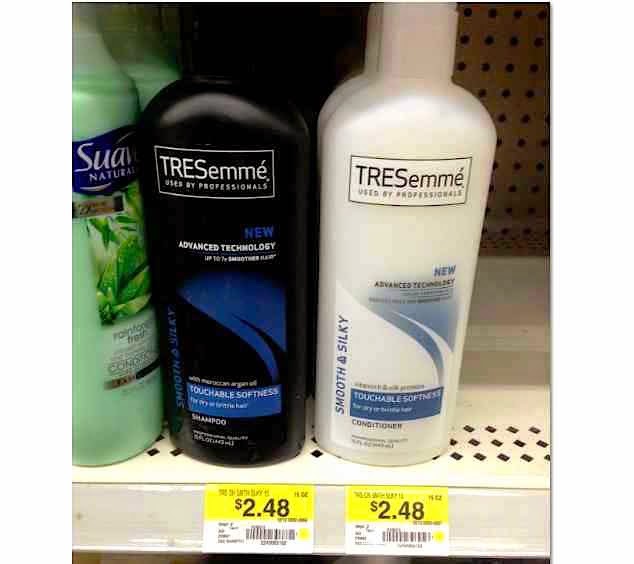 Two products really, the TreSemmé smooth & silky conditioner and Ichikami hair treatment oil. I've been using TreSemmé through this entire 5 year journey of hair color changes and it's kept my hair silky smooth! I really hope this blog post was helpful! Coloring dark Asian hair isn't the easiest, neither is keeping hair healthy after frying it with bleach and curling irons. But it's definitely possible. 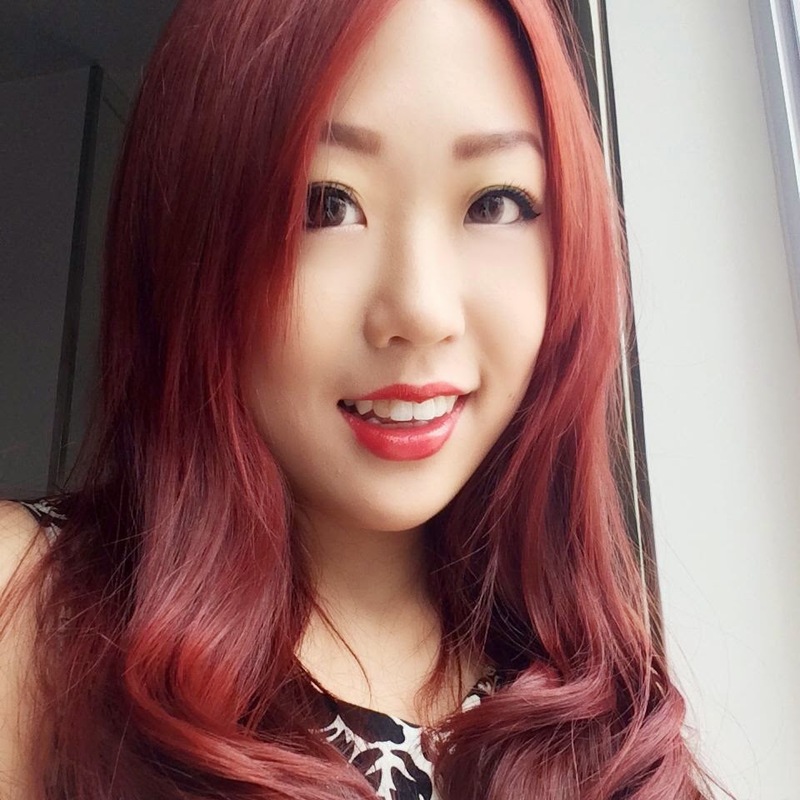 After salon disasters and trial & error, I want to share as much experience so I can to give insight to those of you who are struggling to get the hair color you want. This hot iron heats quickly, is light weight and easy to maneuver. It only had two heat settings so if you need a really hot iron to style your hair this one might not be your preference. It has worked well for me but I did struggle getting filling it with water the first couple times. The safety glove has come in handy and is a nice bonus feature that most hot irons don't have at https://www.amazon.com . Thanks for this post. It sounds like you went through a lot with your hair experiences. I have been experimenting with bleaching for about a year and have liked the results. I would like to try some fashion colors (blue, purple, etc. ), but I have read that most of them stain your pillows when you are sleeping or your clothes if you are caught in the rain. Did you notice if the two brands you used for your fashion colors did that at all? If they did not stain anything, where might I find them? I am from the U.S.. Can they be found online? And I think all the shades of red, orange, and blonde (especially the sunset hair) was very pretty in your hair. It makes me think of summer and being among many peach trees, smelling the wonderful peach aroma.